SimplyGo is the ONLY portable oxygen concentrator (POC) to offer continuous flow and pulse-dose delivery in a single device weighing only 4.5Kg. That means you can now manage your therapy and lifestyle needs with just one POC. Designed to be rugged and easy to use, SimplyGo is truly a new breed of lightweight and attractive portable concentrator. From Philips Respironics. 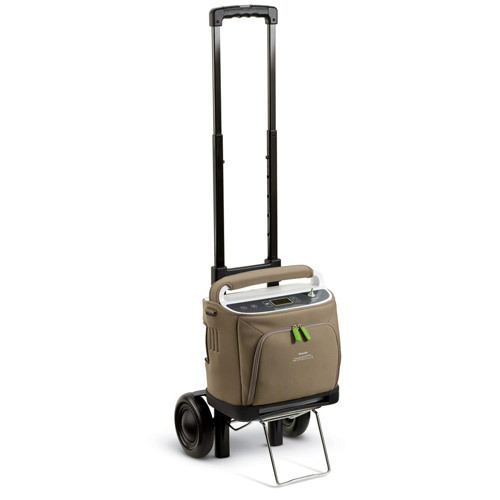 When choosing Oxygen Choice you have the confidence that your oxygen concentrator, whether it be the Simply Go Philips Respironics Portable Oxygen Concentrator or a different model, it will be delivered to your door by a trained technician who will explain all aspects of your machine including initial setup, recharging, power management, safety tips and oxygen settings. It’s all part of the our service.